TERMS AND CONDITIONS OF THE AUCTION By registering to bid or placing a bid, you agree to be bound by all of these terms & conditions and any other announced terms and conditions of sale or rules of the site. All internet bidders agree that bids placed on the internet shall have the same legal effect as if they were in attendance at the auction in person. ASK QUESTIONS BEFORE YOU BID. THERE ARE NO REFUNDS AND NO RETURNS!!! 1. All persons attending the exhibition, sale or removal of merchandise assume all risks of damage to person or property and specifically release and indemnify High as the Sky Auction Co. and Scott Williams (along with all who herein with HATS auction) associates of company or clients from any liability. 2. Bidder agrees that all property is sold "AS-IS WHERE-IS" with no warranties express or implied and ALL SALES ARE FINAL. Property is open to thorough public inspection. 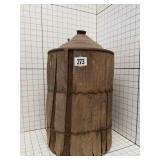 Bidders who bid from off site and are not present at the preview understand and acknowledge that they may not be able to inspect an item as well as if they examined it in person. It is the Bidder's responsibility to determine condition, age, genuineness, value or any other determinative factor. High as the Sky Auction Co. may attempt to describe the merchandise in advertising, on the internet and at the auction but makes no representations. In no event shall HATS be held responsible for having made or implied any warranty of merchantability or fitness for a particular purpose. HATS does not guarantee any appraisals, gradings or certifications. If you have any questions about the merchandise, ASK THEM BEFORE BIDDING. Bidder shall be the sole judge of value. It is Bidder's responsibility to determine if any item is legal where they live. There are no refunds for any reason. By placing a bid, Bidder acknowledges that he or she has inspected the items to his or her satisfaction or chooses to not examine them at his or her sole risk. HATS will not be responsible for any errors or omissions in the description of the merchandise unless it is a material and intentional misrepresentation of the item itself. Bidder agrees that he or she may not return any item they purchase for any reason accept an intentional and material misrepresentation of the item itself made by HATS. Bidder's sole remedy in the event of an intentional and material misrepresentation of an item shall be to return the item, at their expense and in the same condition it was shipped to them. If HATS agrees that the item was materially and intentionally misrepresented HATS will refund the Bidder's purchase price to him/her. Bidder agrees that under no circumstances whatsoever will HATS ever be liable to any bidder for an amount greater than the purchase price of the item they purchased. BIDS CANNOT BE REMOVED UNLESS IT IS AN OBVIOUS TYPOGRAPHICAL ERROR. MAKE CERTAIN WHAT YOU ARE BIDDING ON BEFORE YOU BID. 3. HATS reserves the right to charge the Bidder's credit card the full amount of any or all of Bidder's pre or live bids at any time. When the auctioneer says, "sold" Bidder assumes full responsibility for the merchandise. Everything MUST be paid for in full by 5:00 PM the day after the auction. Bidders agree to pay a buyer's premium equal to Twenty five Percent (25%) of the hammer price of each item they purchase. Under state law, sales tax will be collected on the entire amount. 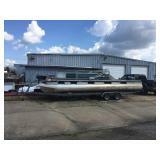 There is a 5% discount for cash payments THE DAY FOLLOWING THE AUCTION ONLY. Any purchase not paid for by 5:00 PM the day following the auction, will be billed to the credit card you registered with. SPECIAL NOTE FOR THIS PARTICULAR SALE: PAYMENTS WILL BE MADE BY CASH, CASHIERS CHECK, CERTIFIED CHECK or WIRE TRANSFER. COMPANY OR PERSONAL CHECKS MUST BE PRESENTED WITH A BANK LETTER OF CREDIT (BANK LETTER MUST BE CURRENT) GUARANTEEING PAYMENT TO High As The Sky Auction Company LLC and be able to be verified the day of payment. 4. If you plan to register a titled vehicle in an area that requires an emission or other test, emissions or other tests are not guaranteed and it is sold AS-IS unless stated otherwise in the item description. All titled vehicles are sold AS-IS TOW AWAY in regards to emissions tests. 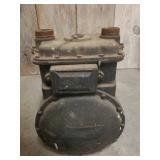 Emission tests are not provided unless it is stated in the item description. If an emission test is provided, it is only valid in the area for which it was issued. It is the buyer's sole responsibility to determine if a titled vehicle is legal and able to be registered where buyer lives. All Motorized vehichles are sold as-is, where-is. No guarantess are expressed or implied by auction company or client. 5. If firearms are sold, all Federal and Alabama laws and regulations will be followed. 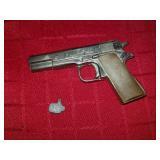 Some firearms may not be legal in Bidder's jurisdiction. It is the bidder's sole obligation to determine if a firearm they purchase is legal where they live. There is a commission charge of 25% charged to resell any firearm(s) that has to be returned due to a buyer's local law. In the event that a buyer is unable to take legal delivery of any firearm(s) he or she will have the firearm(s) returned to HATS and hereby engages HATS to resell the firearm(s) at absolute auction with a commission charge of 25%. Magazines that are not legal where a buyer lives are not included in the sale. No credit will be given for the magazine. 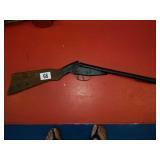 Firearms for this sale are subjject to the following rules: 1. Background checks will be called in and proper ID must be presented with a form 4473 being filled out and approved. 2. Posesion of firarms will only take place at 3031 Wetumpka Highway, Montgomery, Al which is our companies licensed FFL location. 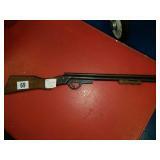 You may fill out the paperwork and pickup your firearm on the Monday following the sale from 12-5 at our office. We are FFL dealers and all local, state and federal laws conserning afirearm sale will be adhered to with no exceptions. 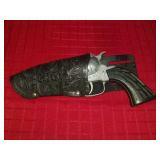 Further stated, Our company also has company policies involving the sale of firearms that must be followed. By bidding in this auction on firarms you agree to these terms and conditions. 6. 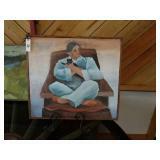 HATS is providing internet only bidding for this auction. 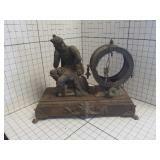 Bidder acknowledges and understands that this service may or may not function correctly the day of the auction. Under no circumstances shall Bidder have any kind of claim against HATS or anyone else if the internet service fails to work correctly before or during the auction. HATS will not be responsible for any missed bids from any source. Internet bidders who desire to make certain their bid is acknowledged place their maximum bids at least two hours prior to the auction closing time. 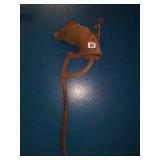 HATS reserves the right to withdraw or re-catalog items in this auction. In the event of any software problem, mistake or other issue, HATS reserves the right to extend the closing times, stop, restart or cancel this auction at its sole discretion. Even though an item may display as "sold" on the internet, no sales are final until they are certified by HATS and Bidder receives an invoice. HATS reserves the right to cancel any or all sales and resell the items in whatever manner it chooses. 7. The bids are advanced at pre-set increments available on the bidding web page. From time to time HATS may accept items with secret reserves prices. 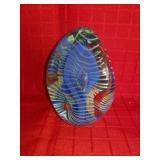 The seller and HATS reserve the right to bid on behalf of the seller on items on which there may be a reserve. HATS may reject or cancel any bid for any reason. The record of the auction made by HATS shall be conclusive. This is a Public Auction and as such, all qualified bidders may bid including HATS owners, family members and employees. 8. If a check accepted by HATS is returned for any reason, Bidder agrees that HATS may re-present it in person or electronically and collect the amount of the check as well as the highest service charges and fees allowed under Alabama law. Any amount left unpaid shall accrue interest at the highest rate allowed under Alabama state law. Unless exempted by law, the purchaser shall pay all applicable taxes. Bidder agrees to indemnify HATS against any claim if sales tax is not collected on Bidder's purchases. Bidder agrees to not stop payment on any check paid to HATS. Bidder further agrees that under no circumstances will he/she initiate a chargeback on his/her credit card. Title to the merchandise transfers to Bidder only when Bidder's payment is honored. 9. All property shall be removed from the premises by the Bidder at her/his own risk and expense within the time period announced. ALL MERCHANDISE PURCHASED AT THIS AUCTION MUST BE REMOVED DURING TIMES POSTED FOR THIS AUCTION UNLESS SPECIAL ARRANGEMENTS HAVE BEEN MADE WITH HATS OR IT IS BEING SHIPPED. Internet bidders should arrange to pick up their purchases within this time. Either HATS or a professional shipping company will ship all merchandise not picked up. Bidder hereby grants the shipper or HATS the right to charge their credit card the entire amount of packing, shipping and handling costs. In the event that Bidder does not pay for shipping, Bidder shall have no claim against HATS and will forfeit the merchandise with no refunds. 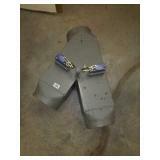 All items will be insured for the purchase price. Our first priority is to deliver your new purchase in excellent condition. Bidder agrees that any merchandise not removed by bidder within seven days of the auction will be forfeited with no refunds. 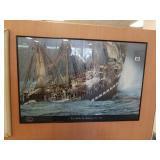 Bidder shall have no claim to merchandise not removed by the above date. 10. Bidder agrees that this agreement shall be governed by the laws of the state of Alabama and hereby grants sole jurisdiction and agrees to submit to the personal jurisdiction and venue of a court of subject matter jurisdiction located in Montgomery County, Alabama. Bidder agrees and grants that service of process on them may be obtained by mailing a certified letter, containing a summons, postage prepaid, to them at the address they provided to register. Should a dispute arise between HATS and Bidder, Bidder waives any right to a trial or hearing in a court of law and agrees to settle the dispute through binding arbitration in Montgomery County, AL with an arbitrator appointed by the President of the Alabama Auctioneers Association. 11. HATS may refuse a buyer's number and bidding privileges to anyone for any reason. Bidder agrees to provide any identification HATS may request including but not limited to: drivers license, photocopies of credit cards, Social Security card or US Passport. Bidder agrees to comply with any stated additional terms or conditions associated with particular items. 12. RISK OF LOSS: THE BUYER ASSUMES FULL RESPONSIBILITY AND ASSUMES RISK OF LOSS FOR ALL ITEMS PURCHASED FROM THE TIME THE AUCTIONEER SAYS SOLD TO THE BUYER. 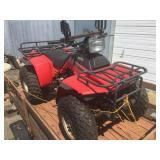 THE BUYER WILL OBTAIN FULL LIABILITY INSURANCE ON ALL ITEMS AS REQUIRED BY LAW. 13. AUCTION SITE: BUYER ACKNOWLEDGES THAT THE AUCTION SITE AND ANYWHERE THE PROPERTY TO BE SOLD IS LOCATED OR DISPLAYED IS A POTENTIALLY DANGEROUS PLACE. HEAVY EQUIPMENT IS BEING OPERATED, POTENTIALLY DANGEROUS MATERIALS MAY BE PRESENT, ELECTRIC CIRCUITS MAY BE LIVE, AND OTHER POTENTIAL DANGERS MAY EXIST. EVERY PERSON AT THE SALE SITE (AND OTHER AREAS WHERE THE PROPERTY IS LOCATED OR DISPLAYED) AT ALL TIMES SHALL BE THERE AT THEIR OWN RISK WITH NOTICE OF THE CONDITIONS OF THE PREMISES, THE ACTIVITIES OF THE PREMISES, POTENTIAL CONDITIONS OF THE PREMISES AND THE CONDUCT OF THIRD PARTIES AND BUYER SHALL SO ADVISE HIS AGENTS AND EMPLOYEES. NO PERSON SHALL HAVE ANY CLAIM AGAINST THE AUCTIONEER, THEIR AGENTS, EMPLOYEES OR PRINCIPALS FOR ANY INJURIES SUSTAINED OR DEATH TO ANY PERSON OR PERSONS WHOMSOEVER NOR FOR DAMAGES TO OR LOSS OF PROPERTY WHICH MAY OCCUR FROM ANY CAUSE WHATSOEVER. BUYER ACKNOWLEDGES RESPONSIBILITY FOR ANY INJURY OR DEATH TO ANY PERSON OR PERSONS WHOMSOEVER OR PROPERTY DAMAGE CAUSED BY BUYER, HIS AGENTS OR HIS EMPLOYEES. 13. TAXES & TITLES: ALL ITEMS ARE SUBJECT TO STATE AND LOCAL TAX LAW. YOU MAY ONLY USE YOUR SALES TAX # TO COVER PURCHASES THAT APPLY UNDER THAT NUMBER. ALL OTHER PURCHASES ARE SUBJECT TO TAX. WE MUST HAVE A COPY OF YOUR SALES TAX CERTIFICATE. FAILURE TO FURNISH THIS NUMBER WILL REQUIRE PAYMENT OF SALES TAX. 14. JUDGEMENT OF AN ITEM: ALL PROPERTY SELLS AS IS, WHERE IS WITHOUT WARRANTY OF ANY KIND, EXPRESSED OR IMPLIED. 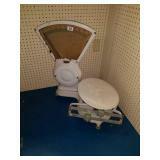 THERE ARE NO WARRANTIES AS TO THE QUALITY, CHARACTER OR CONDITION OF ANY OF THE ITEMS. PLEASE INSPECT EQUIPMENT BEFORE BIDDING. THE IMPLIED MERCHANTABILITY IS EXPRESSLY DISCLAIMED. THERE IS NO WARRANTY OF FITNESS FOR A PARTICULAR PURPOSE. THE BUYER SHALL NOT BE ENTITLED TO ANY ADJUSTMENT OR ALLOWANCE, DAMAGES OR ANY OTHER REMEDY OR CLAIM ON THE QUALITY, CHARACTER OR CONDITION OF ANY ITEM PURCHASED. 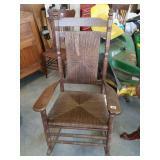 DO NOT BID UNLESS YOU HAVE INSPECTED THE ITEMS AND DETERMINED THE CONDITION FOR YOURSELF. HIGH AS THE SKY AUCTION COMPANY., LLC. IS ACTING TODAY SOLELY AS AN AUCTIONEER. 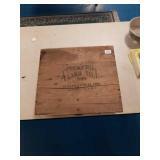 HIGH AS THE SKY AUCTION COMPANY., LLC. 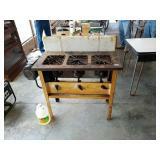 IS NOT THE SELLER, AND THEREFORE MAKES NO WARRANTY AS TO QUALITY OR CONDITION OF THE EQUIPMENT OR ITEMS. 15. 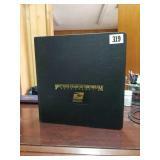 ALL DESCRIPTIONS AND CONDITIONS OF EQUIPMENT IN THIS CATALOG ARE BELIEVED TO BE CORRECT AND HAVE BEEN CONSCIENTIOUSLY SET FORTH BY THE OWNER. 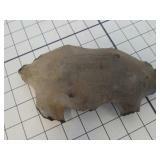 HOWEVER, NEITHER THE OWNER NOR THE AUCTIONEERS ARE RESPONSIBLE FOR ANY ERRORS IN DESCRIPTION OR CONDITION. THE BUYERS CATALOG ACTS AS A GUIDE ONLY. 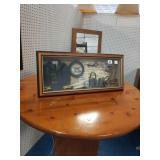 THE AUCTIONEER DOES NOT GUARANTEE YEAR MODELS, MILEAGE OR CONDITION OF AN ITEM. METER READINGS OR MILEAGES IN THIS CATALOG ARE NOT GUARANTEED AND ARE MERELY A READING AT TIME OF CHECK IN. 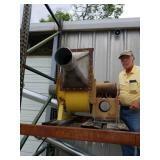 BUYER ACCEPTS RESPONSIBILITY TO INSPECT AND VERIFY HOUR OR METER READINGS BY ANY MEANS NECESSARY PRIOR TO BIDDING. 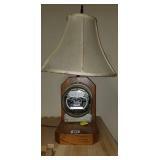 AUCTION COMPANY IS IN NO WAY RESPONSIBLE FOR ANY DISCREPANCIES OF HOUR OR METER READINGS. 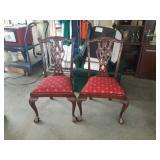 ANY MANUFACTURES WARRANTIES STATED IN CATALOG ARE PROVIDED BY SELLER TO THE AUCTION COMPANY AND HAS NOT BEEN VERIFIED. BUYER ACCEPTS RESPONSIBILITY TO VERIFY ANY STATED WARRANTIES WITH THEIR LOCAL EQUIPMENT OR TRUCK DEALERSHIPS. 13. LIVE pereview of items is set fot Friday 09/12/2018 from 12:00 until 7:00. 14. Items may be picked up from 3521 Wetumpka Hwy Montgomery,Al36110. The pickup and payment day for this sale is Wednesday September 19, 2018 from 10-5. This is an amazing lifelong Partial Estate Collection of Gene Mcneil. 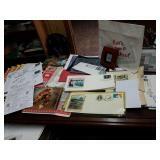 Gene collected various items over the years and has amassed a very nice collection. 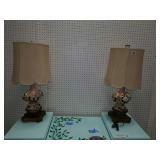 Check out all the items and pictures and good luck bidding. Stunning Mt. 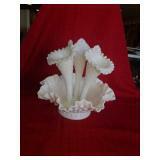 Washington Burmese Jack in Pulpit Vase. Approx 14" tall. Excellent condition. 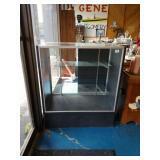 Glass Front Store Display Case. Approx 42" tall x 36" wide x 20" deep. 2 glass shelves on the inside. Sliding doors on back. 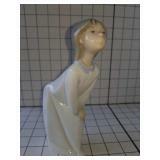 Beautiful Lladro "Reaching the Goal" Figurine. Excellent condition. Approx 9" tall. #5546. 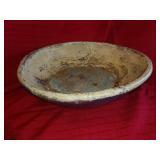 Vintage African dough bowl approx 19x20x10"
Stunning Carved Wood Buffet. Great condition. Does have one leg that needs a little love. You can view it in the photos. 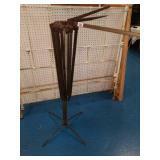 Approx 44" tall (at tallest point) x 68" long x 20" deep. 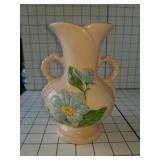 Magnolia matte hull vase, the white on the rim is not a chip, it looks like it was there when made. 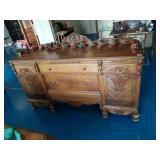 Beautiful Carved Wood Flatware Chest. Approx 41" tall x 38" long x 18" deep. Excellent condition. Minor surface scratches that can be buffed/polished out. 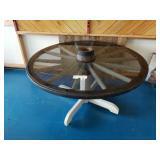 This is a beautiful fully restored Real Wagon Wheel table with glass a glass top. 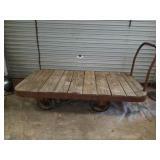 The wagon wheel is easy to haul and will come apart into four pieces. It measures approx. 54 inches round by 29 1/2 tall on wheels. 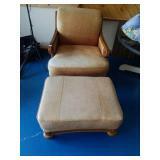 This is a very nice oversized leather chair with ottoman. 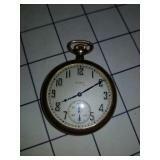 This vintage piece does have some normal wear from age but is in overall very good condition. Buying as pictured. 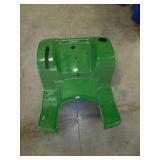 Planter is in good condition, on the bottom there is a small chip. Selling as pictured, see pics. 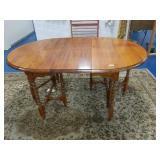 Beautiful Carved Wood Dining Table & 4 Chairs. 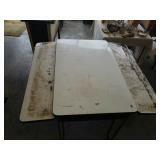 In excellent condition with minor surface scratches. Comes with butterfly leaf. 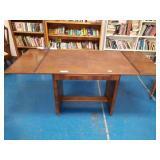 Table measures approx 79" long with the leaf & approx 41" wide. 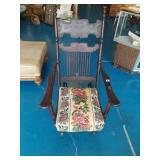 This is an awesome Antique glider rocker with adjustable back. 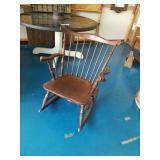 This rocker is in overall very good condition. Selling as pictured, see photos. 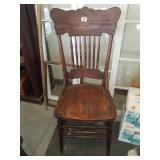 Overall this chair us in good condition, some light staining. Perfect one ready for paint. Selling as pictured, see photos. What an amazing piece from local painter Yavis. This piece was authenticated by Yavis's son who now lives in Florida. 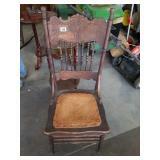 He stated this could be a rare piece of Possibly Black Americana, which she was not known to do. 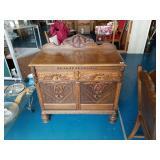 Beautiful 1900's English Oak Love Seat. Excellent condition! 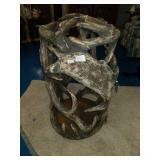 Approx 41" tall x 35" wide x 22" deep. Candy apple red velvet-like material. 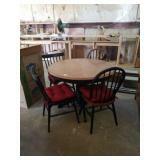 Vintage Ice Cream Parlor Table & 2 Chairs. Wood and iron made. 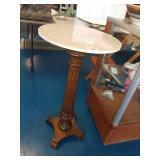 Table approx 29" tall x 24" wide. 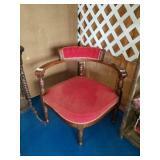 Antique Red Corner Chair. Excellent condition. Approx 25" tall x 27" wide. Buying as pictured. 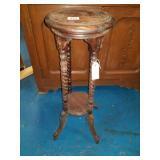 Beautiful Solid Wood Barley Twist Plant Stand. Approx 29" tall x 11" wide. 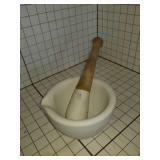 Vintage Enamel Ware French Bidet with Wooden Base. Approx 17" tall x 19" wide. Buying as pictured. 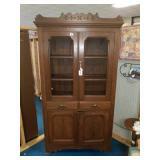 Beautiful Antique English Oak Secretary with Key. Excellent condition. Approx 55" tall x 30" wide x 17" deep. 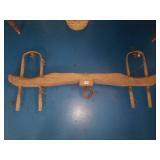 Pair of Han dynasty equestrian soldiers, buying as pictured, han dynasty 206 b.c.-220 a.d.
Nice Vintage rocking chair. Selling as pictured. 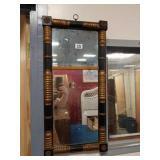 Great decorator item. Selling as pictured. Measures aporox. 32 inches by 16 5/8. 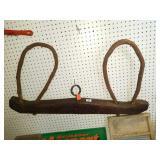 Antique Wooden Double Ox Yoke. Approx 40" wide x 21" tall. Buying as pictured. See photos. 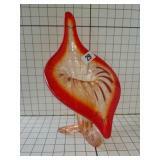 Vintage Red Glass Ship Lantern. Approx 21" tall. Buying as pictured. See photos. 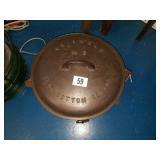 Vintage Griswold #9 Flat Bottom Kettle with Lid. Buying as pictured. See photos. 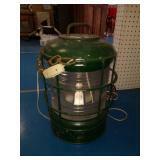 Vintage Green Ship Lantern with Clear Glass. Approx 17" tall. Buying as pictured. See photos. 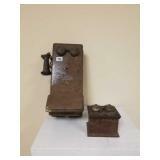 Solid Wood Candle Mold with Iron Stands. Mold makes 12 candles. Approx 39" long x 3" wide. Buying as pictured. See photos. 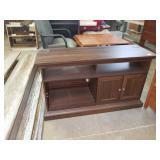 Beautiful Dark Wood T.V. Cabinet. Approx 75" tall x 42" wide x 23" deep. Buying as pictured. See photos. Solid brass with thick glass, buying item as pictured. 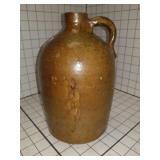 Old clay pitcher, approx 10" tall, buying item as pictured. 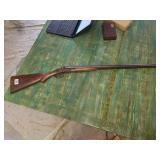 Vintage Child's Double Barrell Shotgun TOY. Buying as pictured. See photos. 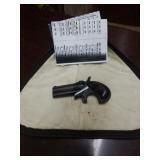 Vintage Child's Toy Rifle. Buying as pictured. See photos. 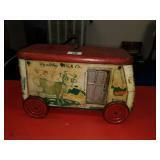 Vintage Original Metal Healthy Milk Co Toy. Buying as pictured. See photos. Approx 13" long x 8" tall x 7" wide. 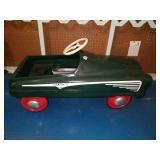 Vintage Green Toyland Metal Pedal Car. 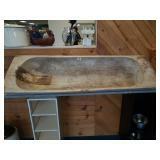 Approx 4 ft long x 1 1/2 ft wide. Buying as pictured. See photos. Pedal needs to be slid back on. 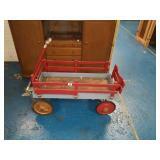 Vintage Grey Hound Metal Wagon. Buying as pictured. See photos. 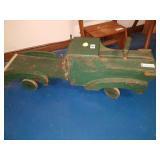 Vintage Solid Wood Toy Truck. Approx 3 1/2 ft long. Buying as pictured. See photos. 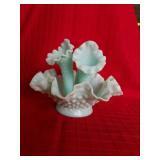 Alcobaca Portugal 5 finger vase 425, 1 finger has been repaired, see photos, buying item as pictured. Awesome must have piece. 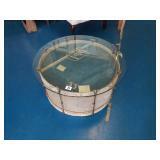 Vintage Original Brass Drum that has a custom cut glass top piece applied, but can be separated from it. Selling as pictured. Glass measures approx. 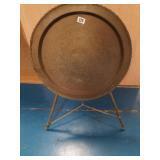 28 Round, Drum measures approx. 24 1/2 round. 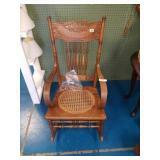 Overall great chair, it is missing two of the small spindles that go under each armrest. Selling as pictured. In overall good condition. Selling as pictured. 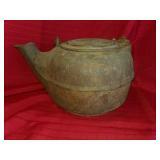 Very nice English Oak Coal Scuttle, in very good condition. Selling as pictured. 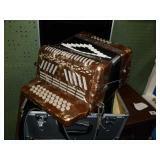 This accordian is in very good working order with the case. It plays very nicely. Selling as pictured, ser photos. 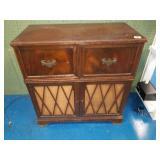 This is a working General Electric Radio and record player combo. Selling as pictured, see photos. 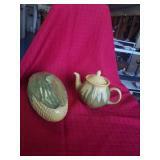 Tea pitcher and casserole dish, buying items as pictured. 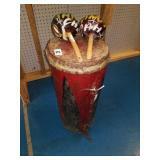 Awesome Vintage Drum with shakers. Selling as pictured. See photos. Measures approx. 22 1/2 × 10 1/2. German Buffet with a key 38" tall, 55" long, 20" deep. See photos. Homeade pine tall round table, mid century modern. Approx 39" tall, 42" wide. See photos. 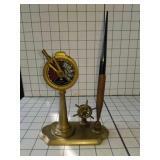 Nautical Shadowbox wallhanger with an anchor, binoculars, and more. Approx 27" long, 12" tall, and 5" deep. See photos. Awesome little vintage wagon. Selling as pictured, see photos. 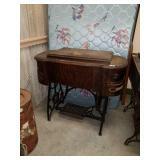 A nice antique school desk with an ink well, with iron base. Approx 26" tall, 20" wide, and 30" deep. See photos. 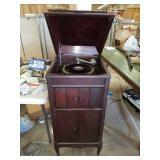 Antique Phonograph by Edison & Records. Model # C 250 & Serial # SM 50041. Approx 88" tall x 21" squared. Several records, not in the covers. Buying as pictured. See photos. 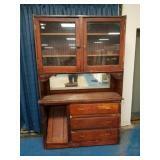 Beautiful Antique Waterfall Dresser. In great shape. Approx 69" tall x 46" wide x 16" deep. Approx Buying as pictured. See photos. 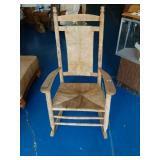 Beautiful Tiger Oak Wooden Rocking Chair. Buying as pictured. See photos. 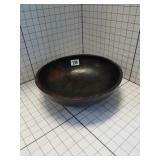 Does have surface scratches, which can be buffed out or polished out. 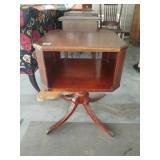 Beautiful Mid Century Modern Style Table with Slide In Leafs. Approx 30" tall x 66" long (with leafs out) x 29" deep. Approx 42" long without leafs. Buying as pictured. See photos for details. 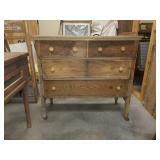 Late 1800's Antique Highboy Oak Dresser with the key. Approx 84" tall x 48" wide x 21" deep. Buying as pictured. See photos. 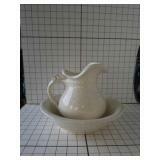 Beautiful 1968 McCoy Pitcher & Bowl. 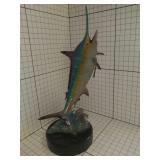 Excellent condition approx 11" tall. Buying as pictured. See photos. 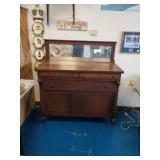 Antique Late 1800's Flame Mahogany Dresser by Berkey - Gay Furniture. WITH THE KEY. Approx 70" tall x 25" deep x 54" long. Buying as pictured. See photos. 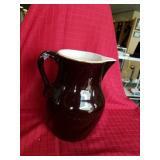 Beautiful Vintage Wedgewood Jasper Ware Pitcher. Dudson Hanley. Approx 8" tall. Buying as pictured. See photos. 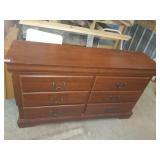 1975 Thomasville 2 Drawer Night Stand. Buying as pictured. See photos. Selling as pictured, see photos. 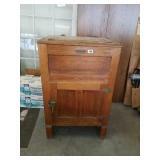 Solid wood 1800's washing machine for delicate laundry. One of the racks on the inside has a peice missing. Approx 39" tall, 42" long, 20" deep. See photos. 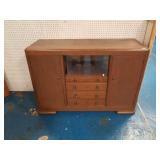 Mid Century Modern Style Chifferobe. Approx 67" tall x 23" deep x 40" wide. Great condition. Slight surface scratches. Buying as pictured. See photos. 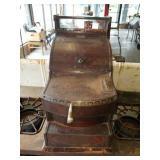 Antique 1930's Maytag Washing Machine & Wringer. Approx 42" tall at highest point. Buying as pictured. See photos. 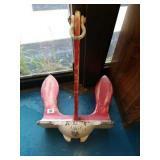 Vintage Navy Anchor Weight. Buying as pictured. See photos. 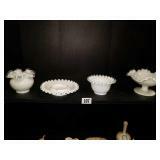 Milkglass hobnail 3 horn epergne. With 3 extra horns. Appears to be in good condition. Buying item as pictured. 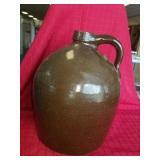 Pottery jug with handle, appears to be in good condition. Buying as pictured. 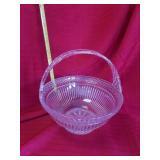 Biscuit bowl wormy buckeye. Buying item as pictured. 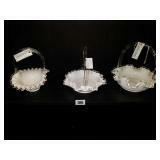 Lot of 3 very nice Fenton Silvercrest baskets. All are in good condition. Selling as pictured, see photos. 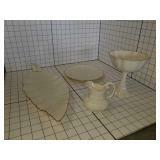 Very nice estate lot of 4 pieces of fenton silvercrest glassware. 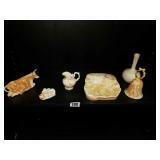 All pieces are in good condition, no chips or cracks. 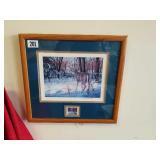 Selling as pictures, see photos. Estate lot of 6 pieces of Alabama Clay Pieces. Pieces have a few dings here and there. Selling this lot as photographed. 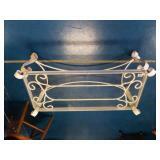 Selling this Antiqur iron bed, headboard and footboard. Selling as pictured, see photos. Check out this cool painted vanity. Selling as pictured, see photos. It measures 46 3/4 by 19 deep and 26 1/2 tall. 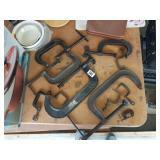 Measures approx 15x 4 1/2", buying item as pictured, see photos. 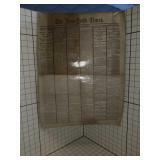 Original 4 page newspaper from "The New York Times" of President Lincoln's assassination. April 15, 1865. Buying as pictured, see photos. What a cool, hard to find item. Selling as pictured, see photos. 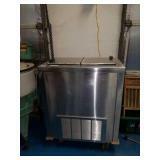 Roll Around Stainless Steel Ice Cream Freezer. Approx 35" tall x 28" wide x 18" deep. Works well! Buying as pictured. See photos. 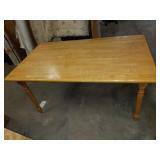 Antique Oak Dining Room Table with 2 leafs 45" long, 29" tall. See photos. 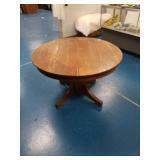 Solid Wood Drop Leaf Table with butterfly leaf. 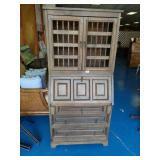 Approx 29" tall x 62" long x 42" wide. Buying as pictured. See photos. 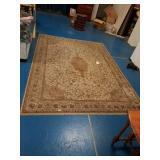 Large Beige Area Rug. 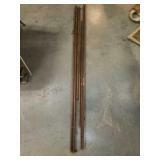 Approx 137" long x 99" wide. Solid Wood Carpenter Tool Box. 32" long, 15" tall, 21" deep. See photos. 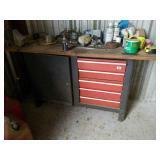 Vintage Carpenters Tool Chest. Small wear and tear. Approx 11" tall, 28" long, and 18" deep. See photos. 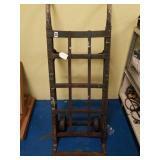 Vintage heavy duty steel hand truck with wooden handles. Approx 48" tall, 20" wide. See photos. 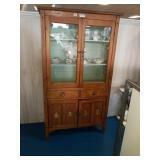 A nice primitive cabinet, has a broken door, and several missing handles. 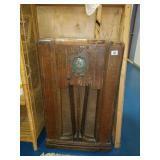 Top pieve os approx 48" tall, 51" long, and 15" deep. The top piece is 33" tall, 53" long, and 16" deep. See photos. 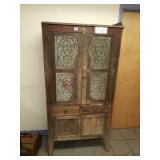 Vintage Handmade Armoire with latch on inside and minor chip on the right door. Approx 73" tall, 45" long, and 17" deep.see photos. 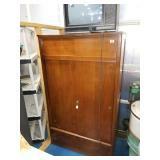 A beautiful vintage chifferobe with hat box and key. Approx 71" tall, 37" long, and 19" deep. see photos. Nautical 1896-1996 "le siècle du belem". Photographie by plissom la trinité. Approx 24" tall, 36" long. See photos. 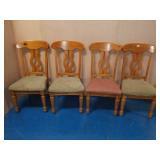 Set of 4 Wooden Chairs. Green Upholstery on 3 seats while one seat has been reupholstered with a red and khaki fabric. I do have extra striped fabric for the other seats. Buying as pictured. See photos. 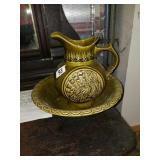 Collectable asian oriental brass wall hanging. This is a very unique piece. 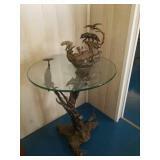 The stand is 37" tall and the plate is 24" tall. Buying as pictured, see photos. 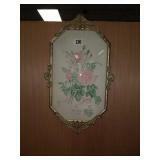 Vintage Framed Ann Getheu Print with Bubble Glass. Approx 20" tall x 12" wide. Buying as pictured. See photos. 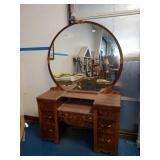 Antique 1800's mirror. Approx 13" long, and 28" tall. Buying as pictured, see photos. 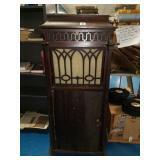 Antique Wooden Broadcast Radio. Approx 37" tall x 22" wide x 11" deep. Buying as pictured. See photos. 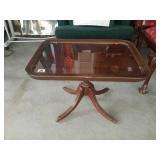 Solid iron base with glass top coffee table 40" long, 18" wide, and 14" tall. 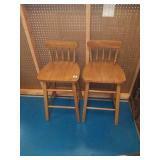 Pair of Solid Wooden Stools. Approx 33" tall. Buying as pictured. See photos. 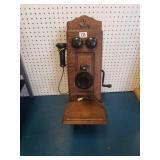 Antique telephone that has a radio in it. Chip on the microphone. Approx 25" tall, 13" deep, and 10" wide. Buying as pictured, see photos. 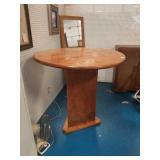 Miller Time miller high life beer pool table, buying item as pictured, see photos, approx 46"
Hand made tropical hardwood cocobolo dough bowl. 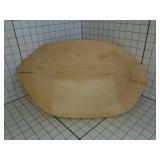 A bowl this size can only be made of a heavy dense type wood without splitting after curing. Buying item as pictured, see photos. Approx 12". What an amazing piece. 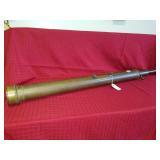 This is a very nice antique brass possibly nautical telescope. It has good optics and focusing well. It. Measures approx. 54 3/4 fulle extended and 51 7/8 closed. In overall great condition. 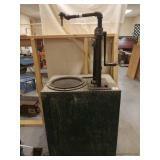 Boiler with lid, lid hangs on the side of the pot. 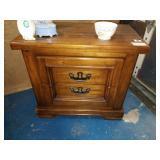 , buying item as pictured, see photos approx 23" x13"
This is a very nice Antique tiger oak server. This piece also has the key. Selling as pictured, see photos. Measures approx. 55 inches Tall by 22 1/4 deep by 50 wide. 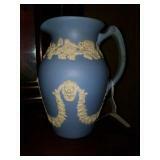 Beautiful Antique pitcher and bowl set. The bowl does has a couple of cracks and the pitcher has a hairline in the bottom as it can be seen in the pictures provided. You have to look real hard to find this item. 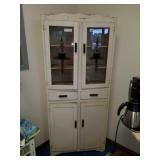 Vintage Solid Wood Pantry with Glass Front. Approx 68" tall x 30" wide x 11" deep. Buying as pictured. See photos. 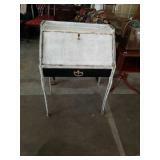 Enamel ware top table with drawer and wooden legs. Approx 40" long, 24" deep, and 30" tall. Buying as pictures, see photos. 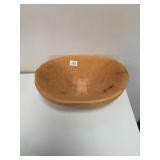 Wooden dough bowl that was signed by richard. 16" long, 12" wide. Buy as pictured, see photos. 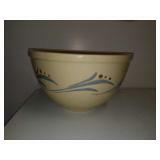 Beautiful Vintage Roseville Pottery Bowl. Approx 6" tall x 11" wide. 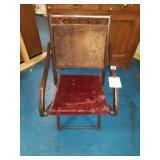 Marked on bottom - R. Excellent condition. No chips or cracks. Crazing has started due to age. Beautiful Cast Iron Enamel Ware. Buying as pictured, see photos. 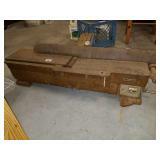 1800's Carpenter Tool Trunk with lock and key. 19" tall, 44" long, and 20" deep. Needs a coat of paint. See photos. 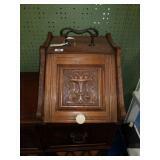 Showcase with lock and key, top is cracked, buying as pictured, see photos. 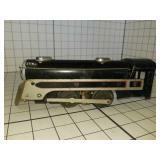 Electric engine for train set from the 50's. Buying item as pictured, see photos. Set of 4 lenox 24 kt gold hand crafted , buying item as pictured, see photos. 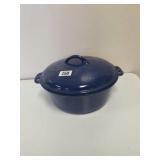 Large vintage clay pot with lid. Small crack in the side. Approx 13" wide, and 15" tall. Buying as pictured, see photos. 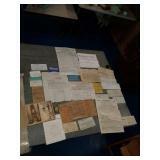 Tallassee mills papers from 1917-1950's. Harrington Family. 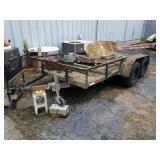 Buying lot as pictured, see photos. Tin box with 29 tin type photos. Buying item as pictured, see photos. 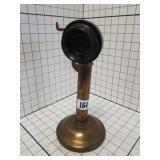 Brass telephone western electric co. Buying as pictured, see photos. 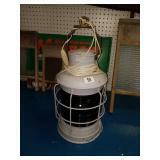 Large Primitive Ox Yoke Converted into Lamps. Said to be from the home of Ida Bell Young. Approx 59" long x 24" tall. 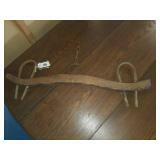 Small Vintage Primitive Ox Yoke. Said to be from Ida Bell Young. Approx 31" long x 10" tall. Buying as pictured. See photos. 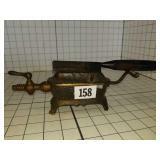 Vintage Cast Iron Sausage Stuffer. Approx 28" long. Buying as pictured. See photos. Invincible, pony boy, smoky, smoky, smoky, pony boy with holster, pony boy with holster. Buying item as pictured, see photos. 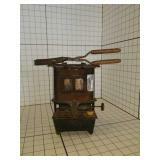 Vintage Empire Child's Electric Metal Toy Oven. 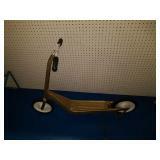 Metal Ware Corp. 115 volts & 600 watts. In working condition. Approx 14" tall x 15" wide x 6" deep. Buying as pictured. See photos. 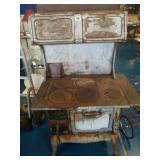 Vintage Empire Child's Electric Stove/Oven. PAT. June 14th 1927. 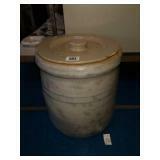 Metal Ware Corp. 115 volts & 600 watts. Knob missing. Approx 14" tall x 15" wide x 7" deep. Buying as pictured. See photos. 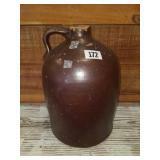 Vintage #2 Brown Clay Jug. Approx 13" tall. Buying as pictured. See photos. 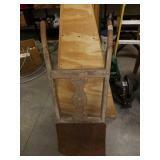 Antique 1900's Kentucky Blue Grass Seeder. Made of wood and metal. 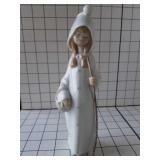 Approx 17" tall x 11" wide x 11" wide. Buying as pictured. See photos. 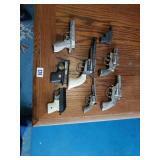 Collection of 6 cap guns and 2 starter pistols. Selling as pictured, see photos. 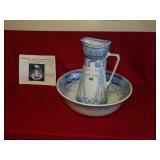 Pal hubley, pam-pam, buying items as pictured, see photos. 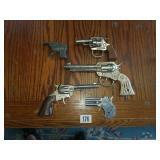 Estate Lot of 5 Vintage Cap Guns. 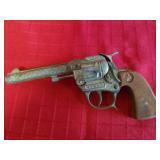 Swallow, Patrol, Restless Gun, Classy Products, & Hubley brand cap guns. Buying as pictured. See photos. 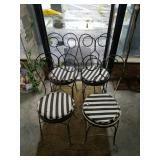 Set of 4 Vintage Black & White Iron Parlor Chairs. Buying as pictured. See photos. 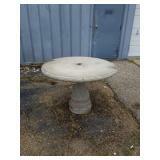 Large Beautiful Concrete Bird Bath. Approx 35" tall x 39" wide. Buying as pictured. See photos. 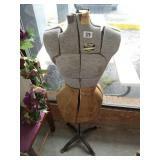 Vintage Tru-Shape Dress Form Mannican by Singer. Approx 50" tall. Bust- 32-40, waist - 25-32, hips - 35-43. Buying as pictured. See photos. 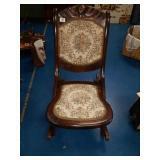 Beautiful carved wood claw feet chairs, buying as pictured, see photos. 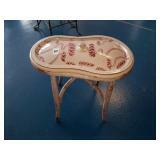 Beautiful Duncan phyfe glass top table, buying item as pictured, see photos. 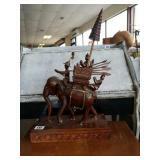 Beautiful Middle Eastern Handcarved Wood Sculpture. Does have minor damages to the hands of the soldiers. You can see the damage in the photos. 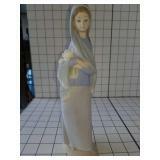 Approx 21" tall x 13" long x 6" wide. Buying as pictured. See photos. 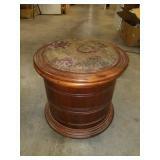 Beautiful Handcarved Wooden Side Table. Approx 28" tall x 21" tall. Buying as pictured. See photos. 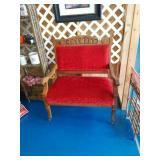 Dark Wood Wicker Rocking Chair. In excellent condition. Buying as pictured. See photos. 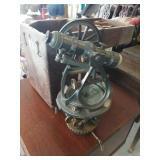 Vintage tiger oak white rotary sewing machine. Buying item as pictured, see photos. Needs a belt. 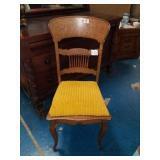 Beautiful tiger oak dining chair, buying item as pictured, see photos. 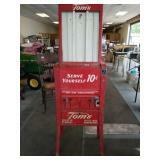 Vintage Tom's Metal Snack Dispenser for Peanuts & Sandwiches. 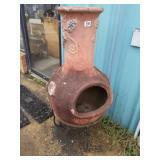 Approx 61" tall x 19" wide x 10" deep. Buying as pictured. See photos. 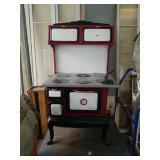 Beautiful red, black, and white awesome Restored cast iron stove. 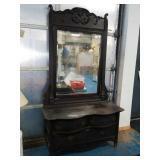 This piece has been restored to show its potential original condition. Buying item as pictured, see photos. 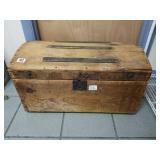 Antique Oak North Pole Ice Box. In really great shape! Approx 40" tall x 17" deep x 27" wide. Buying as pictured. See photos. 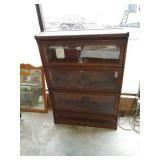 Beautiful Antique Stackable Lawyer's Bookcase with original glass. 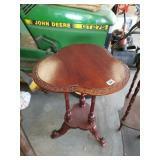 The Globe-Wernicke Co. Approx 47" tall x 34" wide x 12" deep. Buying as pictured. See photos. 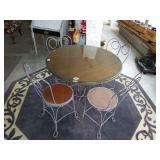 Beautiful Round Vintage Iron Parlor Table & Chairs. Paint on the chairs need to be touched up. Table has a glass top. Buying as pictured. See photos. 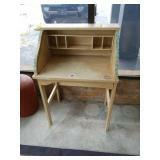 Very nice restored small secretary with drawer. It measures approx. 37 7/8 inches tall 16 1/4 deep by 27 5/8 wide. A custom drawer was built and added to this piece. Selling as pictured, see photos. 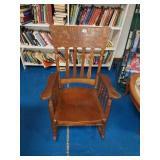 Beautiful Antique Oak Leather Bottom Chair. Great condition! Buying as pictured. See photos. 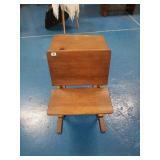 Pretty Child's Size Wooden Secretary. Has handmade decoration on it (easy to removed if you choose too). Approx 32" tall x 22" wide x 15" deep. Buying as pictured. See photos. 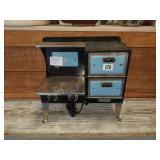 Awesome Antique Florence Gas Stove. Approx 40" tall x 36" wide x 18" deep. Buying as pictured. See photos. 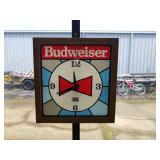 Very nice vintage Budweiser clock with a custom wood frame made for it. It measures approx. 16 x 16 3/4. Selling as pictured, see photos. This great outdoor table has 2 side pull outs. Needs cleaning. Buying item as pictured, see photos. Frame measures approx. 15 1/8 by 14 1/8. Selling in good framed condition. Selling as pictured. See photos. 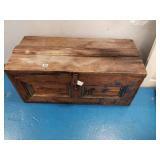 Small Antique Wooden Trunk with Tray. 15" tall x 27" long x 14" deep. Buying as pictured. See photos. 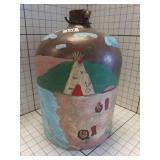 Beautiful Handpainted Folk Art Halltree with a storage compartment. Signed by artist. Approx 82" tall x 27" wide x 18" deep. Buying as pictured. See photos. 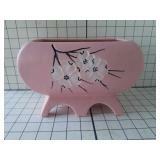 Beautiful coal bucket decorated with painted flowers. Approx 12" tall, 18" deep, and 12" long. Buying as pictured, see photos. 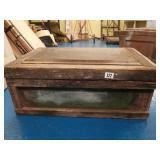 Antique Solid Wood Pie Safe with Metal Front Doors. 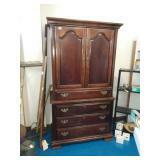 Approx 69" tall x 34" wide x 17" deep. Buying as pictured. See photos. 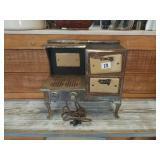 Antique cast iron stove. Birmingham stove and range co. Birmingham, AL. Approx 55" tall, 35" wide, and 22" deep. Buying as pictured, see photos. 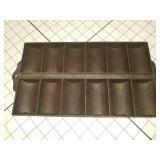 Griswold no 11- 950 cast iron French roll / muffin pan, Erie Pa, buying item as pictured, see photos. 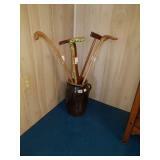 Buying the old Butter Churn with all the canes. The butterchurn is damages as pictured. Selling as pictured, see photos. 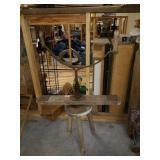 Refinished antique wash stand, approx 36x18x28. Buying item as pictured, see photos. 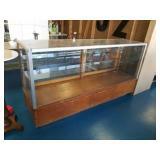 This is an awesome pie safe in overall great condition. It measures approx. 6 feet tall by 38 1/4 wide and 14 inches deep. Selling as pictured, see photos. You are buying approx. 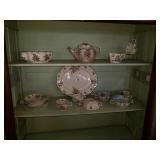 19 pieces of Royal Doulton China. Heavy crazing is apparent in most pieces, displays very nicely. Selling as pictured, see photos. 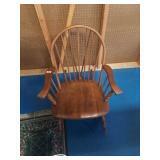 Wooden windser rocker. No scratches or breaks. 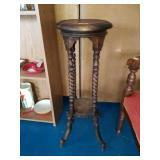 Approx 36" tall, 24" wide, legs are 32" deep. Buying as pictured, see photos. 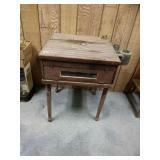 Awesome vintage cash register drawer. 17" long, 19" wide, and 5" tall. Buying as pictured, see photos. 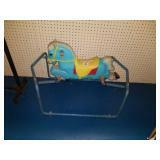 Nice Vintage Childs rocking horse. The horse itself is made put of plastic and is in overall good condition for age. Metal frame and springs. Selling as pictured, see photos. Very nice old scooter. 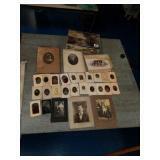 Selling as pictures, see photos. This scale is non working. Selling as pictured, see photos. 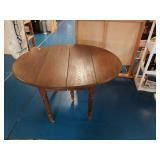 Antique oak drop-leaf table (no leafs). Approx 56" long, 44" wide, 31" tall. Buying as pictured, see photos. From the Grizzly Adams Wilderness Collection. Very nice piece. 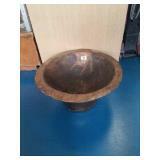 Measures approx 26 inches tall and 15 inches round. Selling as pictured, see photos. This piece is in a very fragile state. Selling as pictured, see photos. Awesome piece. Selling as pictured, see photos. Measures approx. 76 inches Tall by 38 1/2 wide and 15 3/4 deep. Missing glass or screen out of doors. Selling as pictured, see photos. Great piece. Measures approx. 29 inches Tall by 10 inches round. Selling as pictured, see photos. Awesome old transit with box. Optics are good, seems to be a great functioning piece. Selling as pictured, see photos. 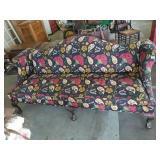 This awesone sofa came from the Belk-Hudson estate associated with Belks department stores according to the current owner who acquired it. This was Ms. Hudson's personal sofa. This sofa has been recovered and is filled with horse hair. 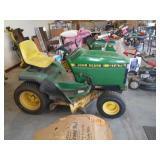 John deere GT275 riding lawn mower. The battery is dead, owner says it needs a cylenoid. Other than that it works good. Tires look good. Buying item as pictured, see photos. 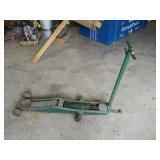 John Deere Rotating Blade Lawn Mower Attachment. #M154958 CPT. See photos. 5000 lb capacity. Weighs approximately 100 lbs. Wheels are pivoted and equipped with roller bearings. Buying item as pictured, see photos. 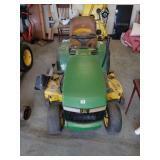 John Deere GT 275 Riding Lawn Mower. Working/Running just fine. Buying as pictured. See photos. 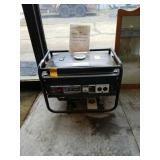 Like-New E Spec Gasoline Generator. Never been used. Works great! Comes with owners manual. See photos. 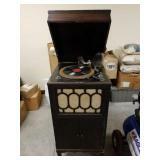 Vintage Columbia Grafonola Record Player. Approx 4 ft tall. 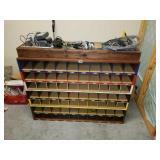 Antique St. Louis Wooden Cash Register with Keys. 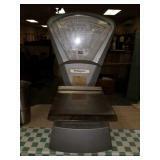 St. Louis Cash Register Co. Working just fine. Approx 17" tall x 10" wide x 16" deep. 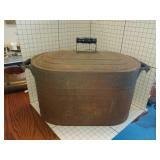 Large Vintage #12 Western Stoneware Co Crock. Great condition! Approx 19" tall x 16" wide. Buying as pictured. See photos. 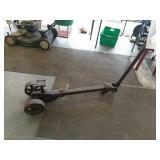 Antique Railroad Cart. In great condition due to age. 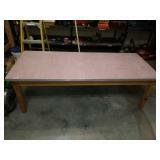 Approx 72" long x 36" wide. Buying as pictured. See photos. 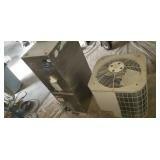 Carrier Split Heat 1 Ton Pump A/C Unit. See photos. 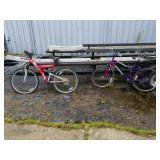 Lot of 2 Mountain Bikes. MT. STORM & MT. CLIMBER. 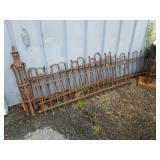 Approx 94, 54, 67, end post approx 34". Buying item as pictured, see photos. 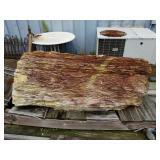 Beautiful Piece of Petrified Wood. 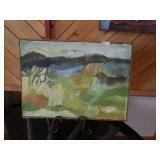 Large piece is approx 4 ft long x 22" wide. Buying as pictured. MUST BRING A WAY OF LOADING. VERY VERY HEAVY. Approx 43" tall. Including stand. Buying item as pictured, see photos. 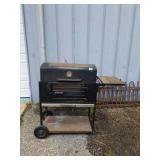 Vintage Handmade Charcoal Grill. See photos. Buying as pictured. Approx 41" tall x 16" deep x 45" wide. 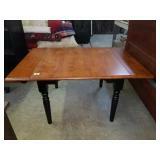 Table is in 2 pieces for easy moving. See photos for condition. 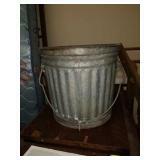 Vintage Metal Trash Can. Approx 3 ft tall. Buying as pictured. See photos. 90 horse power evinrude. Main feature, it has brand new solid aluminum deck. Tires on the trailer are in good condition. Buying item as pictured, see photos. 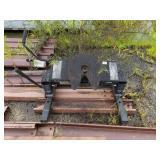 Sunrise Draw-Tite 5th Wheel Hitch. Buying as pictured. See photos. 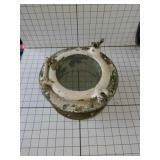 The kettle has a small hole on the side, buying item as pictured, see photos. 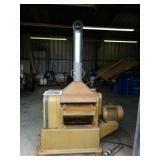 Industrial 3 Phase Blower. See photos. 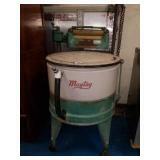 Industrial Powermatic 3 Phase Planer. Comes with the manual. See photos. Approx 4 ft tall x 32" wide. 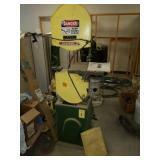 18" blade, 1 blade on it, 3 extra blades, table saw, built on roll around stand. Buying item as pictured, see photos. 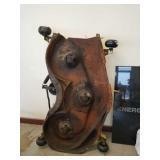 Large Vintage Industrial Jack. Approx 45" tall x 64" long. 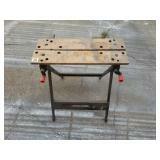 Metal Work Shop Table. Approx 33" tall x 5 ft long x 2 ft wide. Buying as pictured. See photos. CONTENTS ON TABLE NOT INCLUDED IN PURCHASE. 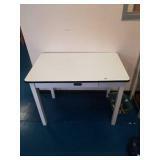 Black & Decker Adjustable Work Bench. Approx 30" tall x 2 ft wide. See photos. 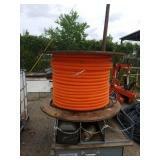 Roll of 1 1/4" flexible conduit . See photos. 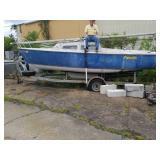 Catalina 22 ft Sloop Boat with Cabin & Trailer. See photos for details. 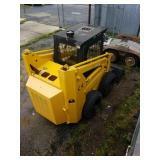 Super Monkey Skid Steer. Brand new motor just put in it & brand new tires (first set of tires). Approx 5 years old. 1845 Chinese copy. 50 horsepower. Approx 300 hours. See photos for details. 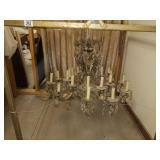 Beautiful Vintage Crystal Prism 20 Light Chandelier with extra prisms. You also are purchasing the metal stand it's hanging on. Measurements in photos & last photo shows size comparison. 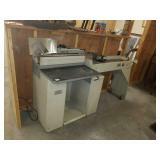 AMT 14" Delta Rockwell Band Saw with Manual. See photos for details. 1800's Antique Wooden Pooper with Enamel Pot Insert. Approx 16" tall x 16" wide. See photos. 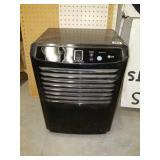 LG Energy Star Humidifier. Works great! 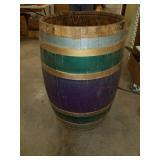 Solid Wooden Whiskey Barrel. Approx 3 ft tall x 22" wide. 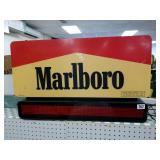 Vintage Marlboro Light with Digital Sign. Approx 17" tall x 28" long x 5" deep. Needing a new transformer. See photos. 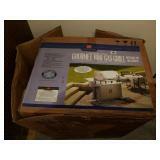 Brand New Member's Mark Stainless Steel Gourmet BBQ Gas Grill with back and side burners. Still has plastic around it inside the box. Some damage to the box, but still a brand new piece. See photos. Berkey & Gay Cheney Victrolla. Working great! 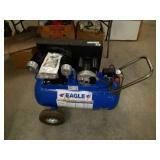 Eagle 6 CFM 100 PSI Air Compressor & Manual. Brand new. See photos. 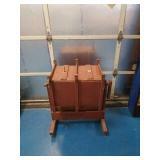 Industrial Heavy Duty Electric Damper. Approx 8" round. John Deere GT 235 Deck. See photos for details. Pennsylvania Grocery/Meat Market Scale. 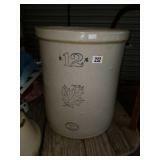 Model # ps-120 20 oz capacity. See photos. 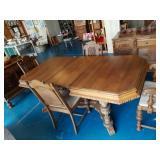 Beautiful Yellow Wood Table. 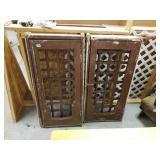 Approx 5 ft x 3 ft.
Beautiful Middle Eastern Window Inserts. Approx 4 ft x 2 ft each. Buying as pictured. 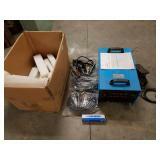 4 in 1 Inverter Super 200 P Welder. Brand new in the box. Removed from box for photos. AC/DC PULSE, TIG/MMA/CUT welder. Comes with all attachments. See photos. 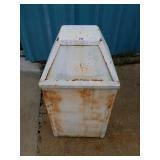 Vintage 1955 Reeves 5 Gallon Galvanized Bucket. 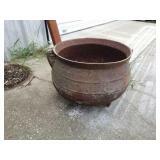 Antique Wooden & Cast Iron Bucket. Approx 18" tall. 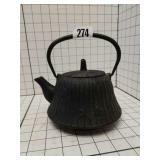 Vintage Cast Iron Tea Kettle for Wood Burning Stove. Approx 7" tall. 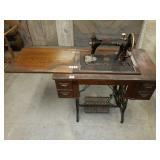 National Sewing Machine Table. See photos. 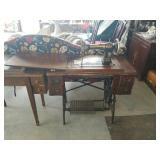 Vintage Standard Sewing Machine & Table. See photos. 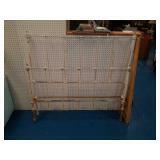 Antique Solid Wooden Quilt Rack. Approx 41" tall x 39" wide. Wooden pegs. Very nice piece. See photos. 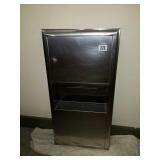 Commercial Stainless Steel Paper Towel Dispenser wih Waste Can. Approx 28" x 14". See photos. 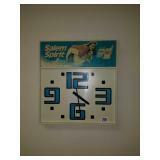 1985 Salem Cigarette Clock. Approx 16" x 17". 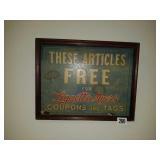 Antique Cardboard Framed Advertisement Sign. Approx 15" x 12". 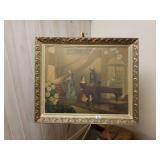 Beautifully Framed Print on Board. Approx 3 ft x 30". Small damages, see photos. 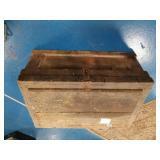 Vintage Solid Wood Bee Box. Approx 30" tall x 2 ft squared. See photos for details. 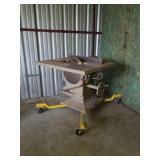 Large Wooden Work Shop Table. 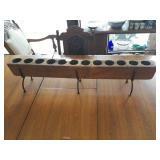 Approx 2 ft tall x 30" wide x 6 ft long. See photos. Robert's business machines Inc. Mailing & printing equipment. It powers on, but I know nothing about how to operate it. Buying item as pictured, see photos. 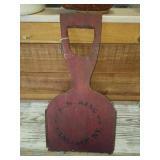 Vintage Primitive Wooden Tool. 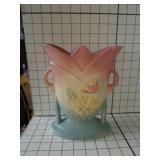 Approx 42" tall at highest point x 29" wide at widest point. See photos. 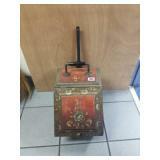 Antique Hungarian Hand Truck. Approx 40" tall x 18" wide. See photos for details. 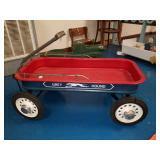 Vintage Metal Wagon. Does have some rust spots due to age. Approx 16" tall x 3 ft long x 16" wide. See photos for details. 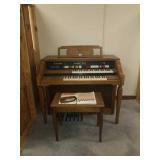 Lowrey Holiday organ with bench, buying item as pictured, see photos. 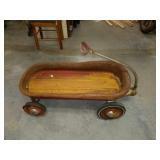 Beautiful Antique Wooden Baby Bed. Frame, mattress, and spring on bottom. Does have a leg that has been repaired. See photos for details. 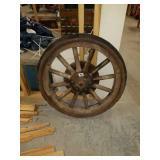 Antique Wooden Wagon Wheel. Good condition! Approx 30" tall x 30" wide. See photos for details. 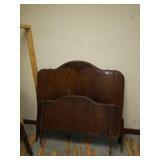 Beautiful Antique Wooden Full Size Bed. 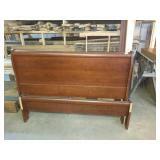 Headboard & footboard. Does need a bit of furniture polish to help the surface scratches. 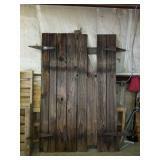 Headboard approx 52" tall x 57" wide. 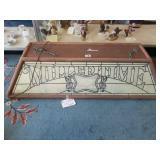 Footboard approx 32" tall x 55" wide. 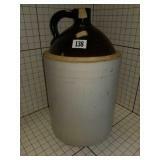 Vintage Bowser self measuring pump oil storage systems, kerosene dispenser. 100 years old. Buying item as pictured, see photos. 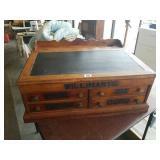 Vintage Craftsman Sears Roebuck Wooden Plainer. Simpsons - Sears Limited - Canada. Model number : 103. 20660. Approx 3 ft long. See photos for details. 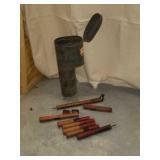 Vintage Rail road flare kit with extra flares and box. Buying item as pictured, see photos. 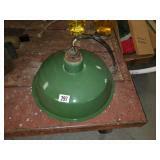 Vintage Green Enamel Hanging Light. Approx 18" tall x 15" wide. See photos for details. Vintage phone and extra bells, the cord from the ear piece to the box needs to be replaced. For the age of this item, it is in fair condition. Buying item as pictured, see photos. 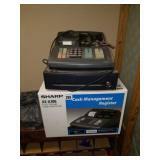 Lot of 2 Sharp Cash Management Registers. One is in used condition, the other is brand new in the box! See photos for details. 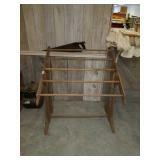 Lot of 3 Vintage Wooden Quilt Racks. Approx 6 ft - 8 ft long. See photos for details. 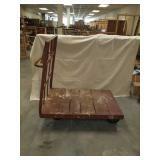 Vintage Railroad Cart. Approx 4 ft tall x 32" wide x 4 ft long. See photos for details. 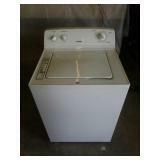 Hotpoint Super Capacity Washing Machine. Working condition. Only used for approx 1 year. Has the agitator in it. See photos for details. 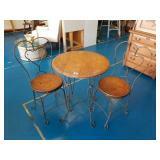 Table with 4 chairs and cushions. All 4 chairs do not match, 2 match and the other 2 match. Buying item as pictured, see photos. 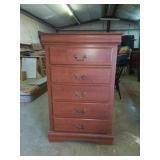 Beautiful 5 Drawer Chest of Drawers. Approx 50" tall x 17" deep x 33" wide. See photos for details. 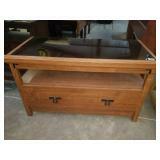 Beautiful Glass Top Coffee Table. 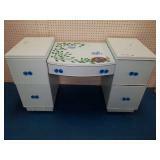 Does have one large drawer on bottom. Approx 2 ft x 40" long x 20" deep. See photos for details. 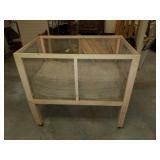 Approx 4 Ft x 16 1/2 x 27" tall, buying item as pictured, see photos. 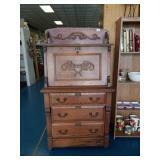 Beautiful 6 Drawer Dresser. 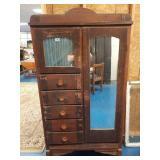 Matches the 5 drawer chest of drawers listed earlier. Approx 34" tall x 17" deep x 5 ft long. See photos for details. 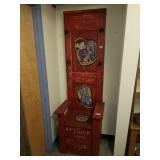 Approx 4ft x 31" x 2ft tall. Buying item as pictured, see photos. Beautiful Queen Size Bed Set. 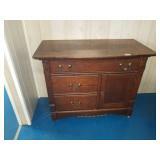 Matches the dresser & chest of drawers listed earlier. 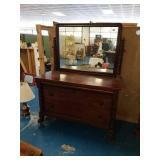 Includes headboard, footboard, rails, and slats. Approx 44" tall x 63" wide. See photos for details. 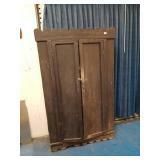 Heavy pair of doors with hinges, one door measures approx 28x90, and the other approx 91x29 1/2, buying items as pictured, see photos. 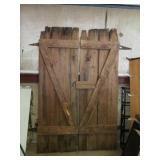 Beautiful Rustic Set of Barn Style Doors. Heavy weighted. One door does have slight repair work that needs to be done. You can see that in the photos. 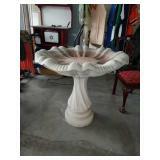 Approx 90" tall x 27 1/2" wide x 1 1/2" thick. 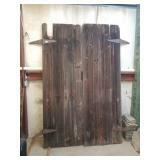 Pair of vintage heavy wooden doors. 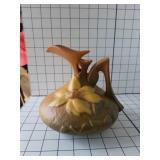 Buying item as pictured, see photos. 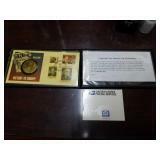 Victory in Europe Coin & Stamp Collection Book. May 8, 1945. See photos for details. 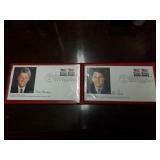 Inaugural Stamps for Clinton & Gore Jr. On envelopes. See photos for details. 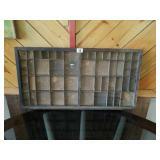 Large Binder Full of Collectable Stamps. See photos for details. 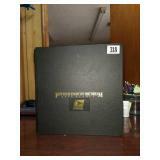 Large Black Binder Full of Collectable Stamps. See photos for details. 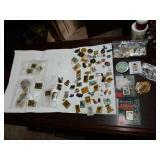 Huge lot of Collectable Stamps. See photos for details. Lot of Collectable Pins. See photos for details. 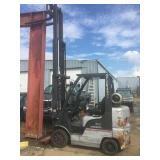 2007 Nissan 5000 lb 17 ft Fork Lift. Works great! Buying as pictured. See photos.